The Magnatone 280 is considered the holy grail of vintage true pitch vibrato by just about anyone who's ever played one. There are lots of magnatone-like vibe pedals out there. Some of them come pretty close. A lot of them don't. But none of them have yet to nail it. And none of them have even come remotely close to getting the true stereo pitch vibrato of the 280 right. It took nearly 3 years and dozens of prototypes, but we finally got it right. 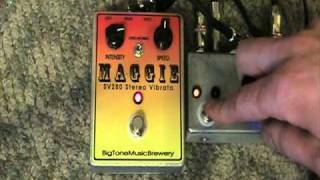 The BTMB Maggie sounds exactly like the real Magnatone 280. The most important part of replicating the tone of real Magnatone vibrato is the dual phase LFO (low frequency oscillator). Without it, you cannot have the push-pull effect that gives the Magnatone its lush rich warble....not even when it's in normal(mono) mode. And you certainly can't get the stereo effect that the 280 had where the sound coming out of one speaker was bending the pitch up, while the sound coming out of the other speaker was bending the pitch down. This isn't your garden variety "stereo" effect that just splits the signal at the end of the circuit and uses an out-of-phase buffer for the secondary output. The BTMB Maggie has a left and a right output with vibrato circuits that are independent of one another for a true stereo effect. You can plug both outputs into any amp that has 2 or more inputs and get the sound of the Magnatone 280. Even though this doesn't create much of a spacial stereo effect, it's what the real 280 sounds like since both of its 2 sets of speakers were housed in the same cabinet. Plug the outputs of the Maggie into two separate amps, switch the Maggie into stereo mode, space the amps far enough apart so that you can appreciate the true stereo vibrato, and prepare to get seasick. The BTMB Maggie features all panel mounted hardware and through-hole components and is meticulously assembled, entirely by hand, in our shop here in the US. And despite the fact that this is a true stereo effect, it still has mechanical true bypass switching. Operates on a single 9V battery or a standard 9VDC power supply.